Since 1991, The C.R.E.W. and the US Forest Service have administered a Partner Agreement under which The C.R.E.W. has maintained, improved and reconstructed more than 600 miles of Forest Service trails. These trails are in several Ranger Districts including Ojai, Santa Barbara and Mt. Pinos Districts. This program is primarily implemented during the summer and spring breaks, and involves crews composed of two adult supervisors and 10 to 12 male and female youth aged 14 to 21, supported by Forest Service personnel. All C.R.E.W. members receive training in safety, personal work ethics, campsite responsibility, job skills, cooperation, leadership and backcountry survival skills. Youth members are paid for their labor and are covered by Workman’s Compensation and Liability Insurance. The C.R.E.W supplies all food. Each crew usually camps out for 5 days at a time. All supervisors are fingerprinted and certified in CPR and First Aid. All crews maintain daily radio contact with Los Padres Forest Service Personnel. Our backcountry campouts are a combination of hard work, education and fun. C.R.E.W. members develop new friendships, build value systems, earn money, learn how to husband and protect our environment and at the same time, have a great time. Each year The C.R.E.W. 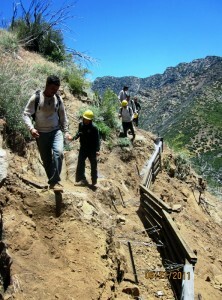 performs trail maintenance on a day work basis for several private and public groups. Clients such as The Thacher School use The C.R.E.W. to maintain their equestrian trails. The Ojai Valley Land Conservancy and The Ventura Hillsides Conservancy also use The C.R.E.W. for habitat restoration and fire prevention, as well as the maintenance of its trails on their preserves. In addition to its recreational trail work, The C.R.E.W. does substantial year-round fire protection work through the construction of strategically sited fuel breaks. The C.R.E.W. has built over 40 miles of fuel break on the notorious Ojai Fuel Bed, as well as another 7 miles of Fuel Break above the towns of Frazier Park and Pine Mountain Club. The C.R.E.W.’s fire protection activities provide a proven career track for youth wishing to pursue fire fighting positions. Each year we collaborate with US Forest Service Fire and Aviation Division and County Fire agencies. This activity has become a prime component in the C.R.E.W.’s work program and resulted in the successful sponsorship by the California Department of Forestry and Fire protection for the 2004 Governor’s Award for Environmental and Economic Leadership. It collaborates with several Fire Safe Councils and Homeowners Associations to ameliorate the threat of fire. Our Ojai Valley Low-Income Senior & Disabled Citizen Fire Protection Program addresses the physical and financial limitations of these two populations as they relate to personal residential fire safety. It also addresses the fact that low-income seniors tend to live in mobile home parks which are extremely fire-vulnerable. We have completed fire clearance for 600 seniors in 4 mobile home parks and private residences during 2011 and 2012. Teams of one supervisor and four youth removed flammable minerals, cut brush, limb trees & brushes, and create residential fire breaks. They also reduced vegetarian fuel on surrounding streets and walkways. The C.R.E.W. also built three 1.5 mile long and 100′ wide fire breaks adjacent to 4 of the mobile parks. This project has been implemented since 2010 and has served over 800 seniors. Piedra Blanca Creek Steelhead Habitat Project – Working with the Department of Fish and Game, Wetland Restoration Program, US Forest Service, California Native Plant Society, and For the Sake of the Salmon, the C.R.E.W. completed siltation and erosion control on 9.5 miles of habitat, revegetated over 100,000 sq. feet and did 5 acres of weed removal. Millenium Tree Project – Working with the City of Ojai, the C.R.E.W. planted 250 in the city of Ojai. Ventura River Project – Working the California Native Plant Society, US Forest Service, and Ojai Valley Land Conservancy, the C.R.E.W. refurbished 14.5 miles of trail, built two river crossings, and erected signage at multiple sites. Sespe Aquatic Ecosystem Reconstruction Project – Working with the US Forest Service, the C.R.E.W. completed siltation and erosion control and non-native plant removal at 19.5 miles of Sespe Creek. North Fork Matilija Creek Project – Working with the US Forest Service, CalTrans, and Department of FIsh and Game, the C.R.E.W. cleaned debris for 7 miles of Steelhead spawning ground and removed over 12,000 full-grown Spanish Broom plants. Ojai Valley Land Conservancy – The C.R.E.W. has enjoyed a a Memorandum of Understanding with this significant Ojai Valley Conservation Group for several years. This partnership has resulted in the repair or construction of 16 miles of horse & hiking trails, the construction of a 5 mile strategically located fuel break, and the eradication of invasive plants such as Tamarisk. Ojai Valley Green Coalition volunteers and the C.R.E.W. have been working together for years doing non-native plant removal in Libbey Park Creeks. The City of Ojai – The C.R.E.W. has also been working since 2010 as part of the city’s Libbey Bowl creek mitigation program. Libbey Park West Barranca Restoration Project- The C.R.E.W. has removed 20 two ton truck loads of non native plants consisting mainly of Himalayan Blackberry and Vinca. Restoration with plants native to the site has now begun with the planting of 55 four foot tall Willows and another 20 Mule Fat bushes. Removal of non native vegetation will continue year round. It has now enabled the creek in the area to increase its water velocity and flow capacity. Removal of the blackberry literally uncovered a creek which has subsequently regained its natural course and is running more freely. The willows have been planted on either side of the new stream. The Lower Ventura River Herbicide Free Habitat Restoration Project- The C.R.E.W. will collaborate with property owner Ventura Hillside Conservancy to implement the part of the Lower Ventura River Parkway Plan that calls for non-native vegetation eradication, habitat restoration. It will restore a greenbelt and trail network that would reconnect the low-income Westside community to public parks and open space along the lower six miles of the Ventura River.